My first encounter with the Finns in Kyy (Viper in Finnish) came about a month ago at the Mörkaste Småland festival. Their performance impressed me enough to warrant a purchase of their debut EP 'Travesty of Light'. Only a few days later, their upcoming full-length dropped in my mailbox and I was, needless to say, eager to take on the challenge. 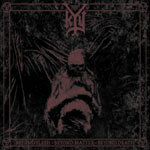 On 'Travesty of Light', Kyy displayed a black metal equally bearing the traits of both Finnish and Norwegian bands. The melancholic melodies of bands like Behexen were neatly mixed with the aggression and rough punkish elements of Taake et al. That fairly unique combination worked surprisingly well, although the EP was seemingly written by a band who were yet to find true confidence as song writers. The sound on 'Beyond Flesh - Beyond Matter - Beyond Death' is pretty much a logical continuation of 'Travesty of Light'. The Finnish and Norwegian influences are still the most apparent, but I also sense a touch of 90's Swedish melodic black metal and even a hint of the Deathspell Omega-esque atonal madness of the contemporary Icelandic scene. Pretty much all of the Nordic countries have more or less influenced this work (well, except for Denmark of course). The major improvement of this album compared to its predecessor, though, lies in the songwriting. Tunes like 'Legio Serpenti' and 'Bloodline of Eden' are both crushing, catchy and simply irresistible. In these songs, as well as on the other peaks on this piece of wax, the combination of punky rock 'n roll-influences, dark melodies and satanic aggression acts in near perfect harmony (or lack thereof). Had the entire album been composed solely of such songs it would have been an instant classic. However, there are also songs on 'Beyond Flesh - Beyond Matter - Beyond Death' that could be labelled, not necessarily as fillers, but simply as less awesome. Even after multiple spins, these tracks fail to display similar greatness. The production is a bit challenging for the listener as the guitar work is rather muddy and somewhat buried in the mix. This is a mere technical detail on the astoundingly awesome tunes, but on the not so astoundingly awesome tunes the production becomes a disadvantage. Not to the point where the listening experience becomes seriously hampered, but a flaw nonetheless. 'Beyond Flesh - Beyond Matter - Beyond Death' is quite a strong debut album combining the best of the different Nordic black metal scenes. Although some tracks fail to reach beyond the average black metal experience, there are several highlights here that seriously challenges the giants in the black metal community. With their unique sound and promising songwriting skills, Kyy is a name to be reckoned with!